L-R: Lon Youngberg, Mason Winters, Nate Stagg, Ben Warnick, Tosh Davis, Jessen Welch & Austin Welch. 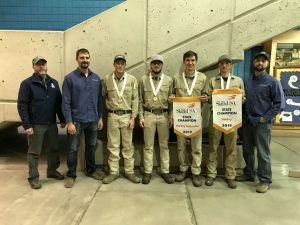 Utah State Eastern’s welding department continued its dominance by earning two gold medals at Utah’s SkillsUSA Competition hosted at Salt Lake Community College last weekend. They also won gold in the T-shirt design category. A silver and a bronze were also taken home by USUE in the diesel skills competition. The welding fabrication team of Tosh Davis and Ben Warnick, of Spanish Fork, and Nate Stagg, of Altamont, placed first in their category. The three are coached by Eastern’s Austin Welch. Jessen Welch of Price, earned a gold in individual welding. He is coached by Eastern’s Mason Winters. Davis and Warnick are making their fourth trip to the National Skills and Leadership Conference (NLSC) – where each state’s SkillsUSA gold medalists travel to determine the nation’s best in June 2019. They won bronze and gold in welding fabrication at the NLSC while juniors/seniors at Maple Mountain High School (Spanish Fork), and gold last year. They have a chance to earn a fourth national metal representing USUE this year. According to their instructors, this is unheard of because there are only two years of eligibility in high school and two years in college. Davis and Warnick graduate with high honors from Eastern with Warnick named valedictorian for the class of 2019. A freshman, Stagg returns to Eastern next year to possibly lead Eastern’s next fabrication team. Jessen Welch’s journey to the top of his field could have played out differently when Welch offered to give his competition spot to Jordan Wynn. In February, Wynn placed second in the USA Welding Trials in Alabama. Wynn has the skills to make this contest look easy, as he has won the individual state competition twice before, but he said, “no, this is your time” and used his expertise and experience to helped Jessen sharpen his skills for competition. Chloe Wilson of Springville earned her gold award in T-shirt design and was mentored by instructor Lori Rager. Wilson won gold last year in a job skill demonstration and placed 10th overall at the NLSC. She served as 2018-2019 Utah Skills USA president. In the diesel skills of the secondary division competition, Anthony Jones of Price took silver while Bodee Cook of Wellington took bronze. The two students were coached by associate professor Dean Collard.